Standard bulk discounts up to 100 lbs. are offered online through our shop bath and shop gourmet pages. We'll beat anyones price in the USA on bulk/wholesale salts. Wholesale orders ship within 1 business day or sooner. Give us a ring and our friendly representatives will be ready to help! Our promise is to deliver exceptional value and complete satisfaction and we pride ourselves on outstanding customer service. Your business is very important to us and our commitment is reflected in our meticulous attention to detail and excellent follow-through we give each and every customer. Not only are you a client, we also see you as a partner to the continued success of our businesses. We promise to always keep you informed, answer questions quickly, be completely honest with the utmost confidentiality. We are one of the largest premier specialty wholesale sea salt suppliers in the USA and have been in the salt business since 2002. We typically maintain a stock of over one million pounds of various raw salts in our California warehouse. We import salts directly from all over The World and offer them at retail, bulk, and wholesale price levels. For additional discounts on larger volumes not shown on the web or any of our brochures, or for competitor price matching, please call us at 1-800-480-4540. • GMP (Good Manufacturing Practices) 3rd Party Certified. • We are registered with Department of Public Health as a certified food processor. • All of our finished products are packaged here in the USA. • We use Optical Sorting Equipment. • We have stringent process controls to ensure consistent quality. • All of our products are tested for stability and safety. • We are fully OSHA compliant. 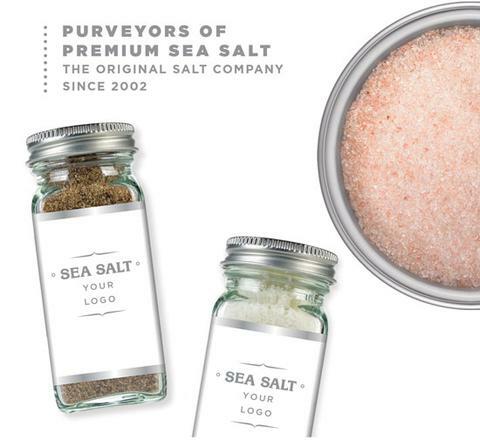 ​San Francisco Salt Company's private label program offers the opportunity for companies to brand any of our premium-quality culinary or spa salts. Choose from our extensive selection of natural salts from around the world or our large selection of blended salts. Packaging options range from glass bottles to bulk pouches or your own custom ideas. With our GMP-certified facility, over 14 years of experience, and meticulous attention to detail, we stand by our products and promise to deliver exceptional value and complete satisfaction every time. In our present day fast paced environment, we understand the need for a quick turnaround so we pride ourselves on short lead times and exceptional customer service. Our private label customers range from national grocery chains, to bath and beauty companies, and everyone in between.